20 July 2018. B&G®, the world’s leading sailing navigation and instrument specialist is pleased to announce their support of PolarQuest 2018, a polar expedition exploring both science and history, with a powerful message for the planet. Their mission is to look for answers to one of the greatest challenges of our time, climate change. 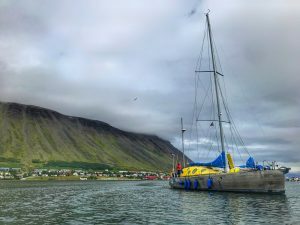 On July 21st 2018 an international team of arctic researchers and scientists will set sail from Isafjordur on the North-West coast of Iceland, to the Arctic Sea on board Nanuq, a self-sufficient sailboat, designed and built by naval architect and Genevan explorer Peter Gallinelli. The team will be looking at climate change, the origin of high-energy cosmic rays and the impact of human pollution at extreme latitudes, as well as creating awareness of the micro and nano plastic contents in the Arctic Ocean. They are also hoping to locate the sunken wreck of Umberto Nobile’s Airship ITALIA, the very first airborne scientific laboratory on the 90th anniversary of its crash. Polarquest’s Nanuq is in Icelnad, ready for the expedition launch tomorrow. Nanuq is a 60-foot Grand Integral sailboat, designed to withstand the arctic winter in a self-sufficient mode, using only renewable energies. This is all possible due to its innovative thermal insulation and heat recovery systems, along with an optimized energy management system. The mission will be guided by B&G electronics, with Nanuq kitted out with an extensive suite of navigation equipment including; Zeus³ 12” chartplotter, StructureScan 3D, H5000 Pilot, WR10 Remote Control, 213 MastHead Wind Sensor, Precision-9 Compass & H5000 Graphic Displays. “B&G is extremely proud to be a technical partner on this exciting mission. We understand that the crew will face some extremely harsh conditions in the Arctic Ocean, and the reliability of their on board systems will be key to their success. Our products have been tried and tested in this environment, so B&G was the perfect choice of electronics partner for their journey. With so many interesting goals PolarQuest 2018 is set to be an exciting mission and B&G are honored to be playing a crucial part of it,” said Leif Ottosson, CEO, Navico Group. PolarQuest2018 is set to be an exciting journey of discovery.